This unexpected result was obtained by Professor Martin Giurfa and his team at the Centre de Recherches sur la Cognition Animale(CNRS/Université Toulouse III - Paul Sabatier). While it was previously thought that only humans and some primates were capable of such sophisticated cognitive analysis, these findings demonstrate that the absence of language and a tiny neural architecture do not hinder this ability. The team's work, published in the journalPNAS, calls into question many theories in fields such as animal cognition, human psychology, neurosciences and artificial intelligence. Human cognition, notably our mathematical and linguistic capacities, is based on our ability to handle concepts1. In everyday life, concepts relating objects together according to their relationship with one anothersuch as 'different', 'the same', 'more than' or 'above'play a predominant role. Car drivers, for example, rely on a complex network of concepts: color codes, arrows, signposts, etc., to find their way. The use of such concepts, which were long thought to be specific to man and certain primates, could be more widely spread though the animal kingdom than previously believed. The researchers showed that honeybees are capable of constructing and handling concepts to reach a food source. They trained groups of bees to enter a chamber where two short corridors led to image stimuli. Each stimulus was composed of two distinct images placed either side by side (see photograph below) or above one another. A reservoir containing either a reward (consisting of a drop of sugar water), or a punishment (consisting of a drop of quinine) was placed between these pairs of images. 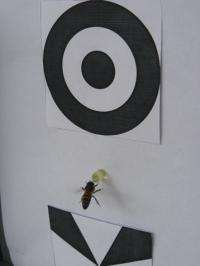 The bees could be rewarded according to one concept (for example 'above/below') and punished for another ('side by side'), or vice versa. For each group, the images kept changing, but the relationships 'above/below' and 'side by side' and their respective associations with reward and punishment were maintained. After thirty training runs, the bees were able to recognize the relation that led to the sugar water. One of the experiments consisted in presenting the same bees with new images. The only common characteristic between the images used during the training and those used for the test was their positioning: above one another or side by side. Even though the bees had never seen these new stimuli, they made correct choices, according to the abstract relationship underlying their position. But that was not all that the study revealed. During training, the two images indicating the reward were always different from one another (as on the photograph below). To find out whether the bees had also learnt this concept of 'difference', the researchers presented them with new stimuli in which the images were in the reward position (for example, one above the other) but were either different or identical. The bees ignored the stimuli composed of identical images, showing that, in addition to the concepts of 'above/below' and 'side by side', they could simultaneously handle the concept of difference in order to take a decision. The results of this study call into question the idea that mammalian brains (including our own), with their larger size, are necessary for conceptual knowledge. They also demonstrate that the formation of concepts is possible in the absence of language. From a philosophical point of view, it fuels the debate surrounding what is specific to mankind. Martin Giurfa's team is now working on the identification of the neuronal networks responsible for this conceptualization.
" This unexpected result "
Have people forgotten the existence of the correspondence principle ? There are always going to be results you didn't expect, why is that a surprise ? There are always going to be results you didn't expect, why is that a surprise? It is by definition. If they weren't a surprise then they wouldn't be unexpected (as these are basically synonyms) and your premise (there will always be unexpected results) would be false. I've always known that we give other life too little credit. Some of the things that the simplest insects do is downright amazing. I took an elective in school called "Insects and Society", I figured it was a throw-away class and an easy A, turned out to be one of the most interesting courses I've ever taken. Couldn't just be caused by the structure of the image processing system, and the bees take the easiest path?